Whether you will be riding English or western, and if you are competing and what specific discipline you will be competing in. What your riding skill level is. How your horse has been trained. The shape and size of your horse's mouth. You should be riding in the mildest bit that still allows you to communicate clearly with your horse. Most horses go very well in some sort of simple snaffle. Sometimes, you'll have to try a few bits to find one that your horse is happy in. Many horses are trained as youngsters in a snaffle and are ridden in snaffles for their whole lives. If you are pleasure riding in a western saddle, there's nothing wrong with riding in a snaffle bit, even if you neck rein. Many western bits are curb bits, but a beginner who might still inadvertently balance themselves with their hands can harshly jab their horse's mouth with these bits. A snaffle bit can be quite harsh if a rider is heavy-handed, but a curb bit with its leverage action will amplify any mistakes that much more. If you feel you must use a curb bit, choose one with the shortest shank you can find. Ideally, a curb bit should only be used if your horse has learned all of his lessons well in a snaffle bit. Often riders will resort to a curb bit, or a long shanked mechanical hackamore because they don't have enough 'whoa', in a milder bit. If you are having trouble stopping, you would be better off going back to schooling and reinforcing the basics. If a horse is hard mouthed it's because the rider has been riding with inconsiderate hands. There is nothing wrong with riding in with a curb bit, provided you understand how it works and how to use it. If you are showing western, you'll probably need to ride with some sort of western curb bit. Just remember that when you pull on the reins with a curb bit, your rein aid is amplified because of the leverage action. You will need to learn to ride with very light, considerate hands. One thing that is sometimes overlooked is the shape of the horse's mouth and dental condition. If you find your horse is having difficulty holding the bit, is lolling his tongue, tossing his head, or stiffening his jaw and poll, it may be because the bit is uncomfortable in its mouth. Some horses have shallow palates, thick tongues or other conformation that makes it difficult to carry some bits. Overgrown teeth and wolf teeth may interfere with the way the bit sits in the horse's mouth. A vet or equine dentist can help with dentition problems. It might take some trial and error to find a bit that is comfortable for your horse to carry. Consider a bitless bridle for hard fit horses. 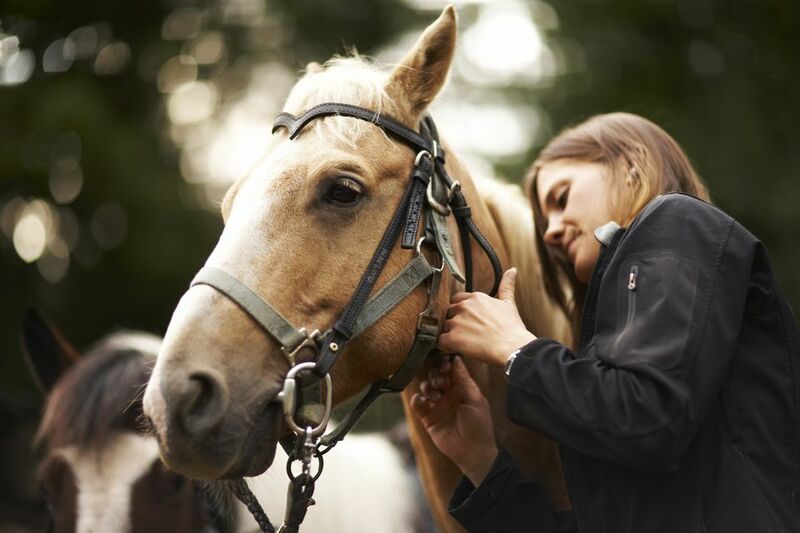 When choosing a bit for a new horse, consider what the horse has been ridden in before. It wouldn't be fair to use a long-shanked curb bit on a horse that has only ever been ridden in a snaffle and expect it to understand your aids completely. If the horse is used to a long-shanked curb, you might find the horse doesn't respond well -- you might not have enough brakes -- in a simple snaffle. This does not mean you cannot make a transition from one type of bit to the other. Horses that are ridden in a curb bit because they have learned to ignore a milder bit can be re-schooled. If for some reason you want to ride in a curb bit, you can school your horse to understand your aids with your considerate hands. Trying out different bits can get expensive if you have to buy each one. Either borrow bits to try or head to the consignment section of your tack shop.